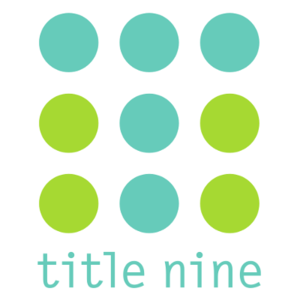 Title Nine offers and makes a collection of only the best women's outdoor and athletic wear, sports bras and casual clothing. We are based in the San Francisco Bay Area with retail stores in California, Oregon, Idaho, Utah, Texas, Washington, Colorado, Wisconsin and Minnesota. We are evangelical about women's participation in sports and fitness activities. We exist to do everything we can to get women and girls off of the sidelines and out on the field.